On Monday, April 21 at 7:30pm, theBestArts.com will present its fifth Broadway benefit cabaret in Atlanta, THE LION SINGS TONIGHT. 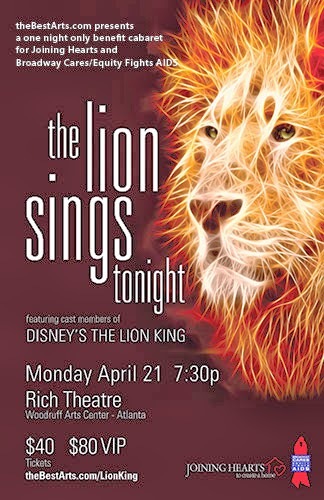 The evening will feature performances by cast and crew members of the Broadway national touring company of DISNEY’S THE LION KING at the Woodruff Arts Center’s Rich Theatre in midtown Atlanta. 100% of ticket revenue from this event will go directly to JOINING HEARTS and BROADWAY CARES/EQUITY FIGHTS AIDS (BC/EFA). Produced by Kevin Ireland, founder of theBestArts.com, along with DISNEY’S THE LION KING company members Ben Lipitz and Jelani Remy, the evening will have audience members Dancing In Their Seats to top 60s hits from Aretha Franklin, the Supremes, Marvin Gaye, the Temptations, the Rolling Stones, Gladys Knight and many more. Over 25 singers, dancers and musicians from the company will showcase their diverse singing and dance talents, accompanied by a live band. A mid-show auction will present opportunities to join the company backstage at THE FOX THEATRE and a June trip to NYC to attend the Broadway show of your choice AND Broadway Bares. A silent auction starting at 6:30pm will feature items donated by DISNEY’S THE LION KING, including show memorabilia. Cash bar. Advance general admission tickets are $40. Advance VIP tickets are $80 and include a 6:15pm pre-show reception hosted by the show’s lead performers. Host and sponsorship opportunities are available as well. Details and tickets at http://www.thebestarts.com/lionking/. Tickets at the door will bed $50 and $90 (VIP) if available. DISNEY’S THE LION KING: Tickets to the Atlanta engagement of DISNEY’s THE LION KING, playing at The Fox Theatre from April 10 – 27 as part of the Fifth Third Bank Broadway in Atlanta 2013/2014 season, are available at The Fox Theatre box office, online at http://www.foxtheatre.org or by calling 1-855-285-8499.